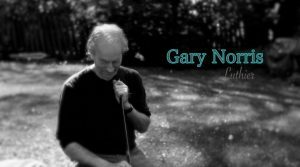 Norris Guitars | Gary Norris - Master Luthier - Satisfaction Guaranteed. Take a stroll into the realm of the voice of woods with me. Hi, I’m Gary Norris, Luthier and owner of Norris Guitars. I’ve been around a while, for quite some years now, doing the work of a Luthier (building, setting up and repairing guitars and other stringed instruments). I come from a long line of cabinetmakers and grew up with a basement and shop full of rosewood and mahogany shavings, and hand tools everywhere. I guarantee my Luthier work regarding quality and satisfaction. Just call me or send a note from the Contact page with your questions, and I’ll reply.